Cities around the world can join the Climathon movement and take part in a 24-hour global hackathon to find solutions to city climate challenges. Organised by Climate-KIC, Climathon brings together the challenges of the world’s cities with the people who have the passion and ability to solve them. The 2017 edition of the global 24-hour climate change hackathon takes place simultaneously in major cities around the world on 27 October and is set to be the biggest event of its kind in history. Representatives of startup incubators, city hall, local businesses, universities or other organisations can register to be the host for their city via the Climathon website and receive a detailed guide on how to organise the hackathon. 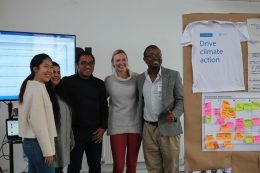 Participants at the Climathon in Leeds, UK, in 2016. To take part in the 24-hour Climathon, each city sets its own climate challenge which reflects what is affecting their urban life the most. Challenges vary from air quality, mobility, water and waste management, and extreme weather events. Innovators tackle the climate challenge for a full 24-hours, before pitching their ideas in front of a local jury. These ideas can develop into tangible sustainable solutions and businesses that address city climate challenges across the globe. “The science of climate change is indisputable, but the problem often seems so removed from everyday reality that organisations have for many years struggled to engage citizens,” said Ebrahim Mohamed, Director of Education at Climate-KIC. “The Climathon changes this, providing the critical impetus for city citizens, innovators, business experts and policy makers to come together in a global climate movement to solve one of the most pressing issues of our time,” Mohamed said. City-level action to address climate change is needed at speed and scale. Cities already contribute over 70 per cent of global carbon emissions and are rapidly growing, with 70 per cent of the world’s population expected to live in cities by 2050. Now its third year of operation, the Climathon movement has grown tremendously over the past two years, encouraging more innovators across the globe to drive climate action. Climathon has grown from 19 to 59 cities in the space of a year, operating across 6 continents, creating over 2330 ideas and reaching 16.8 million people worldwide in 2016. Engage your citizens to take real climate action today! How will you benefit from the Climathon? Get your city involved in the global Climathon movement. Sign up as a city host to take part in this year’s 24-hour hackathon on 27 October 2017. City host registration’s close 15 August. Participants will be able to sign up for their local event via the Climathon website starting 15 August.